You are currently browsing the tag archive for the ‘meditation to ease stress’ tag. One of the hardest things for me to do is to sit in that awful place of discomfort. Life is chock full of these moments. I get to practice being in this place more times than I’d like. I think I am getting better at it but then all of a sudden I’m back in deep and it seems so overwhelming. For me these moments are usually found in times of confrontation, uncertainty or conflict. I know now to take time to concentrate on my breath. I try not to get to caught up with thoughts as those just seem a method that my brain uses to make sense out of the situation and may just be stories created that hold no real truth. So what do you do if you can’t think your way out? Breathe. Concentrating on the moment at hand through breath is the only truth when things are not clear. It is so simple. 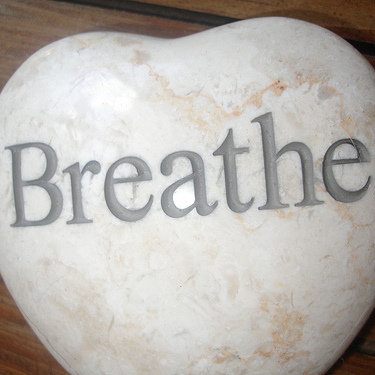 Breath can dissipate these uncomfortable feelings of anxiety, anger and stress. Inhale 1. Exhale 2. Inhale 1. Exhale 2. It is as easy as… taking a breath.